You are looking for a disguised cache. 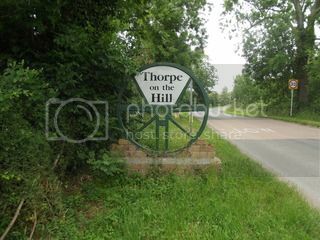 Thorpe on the Hill is a small village and civil parish in North Kesteven, Lincolnshire, England. It is situated less than 1 mile (1.6 km) north from the A46 road, and 6 miles (10 km) south-west from Lincoln city centre. In the 2001 census the parish population was 530. Onfr bs fvta arkg gb oevpx jnyy.